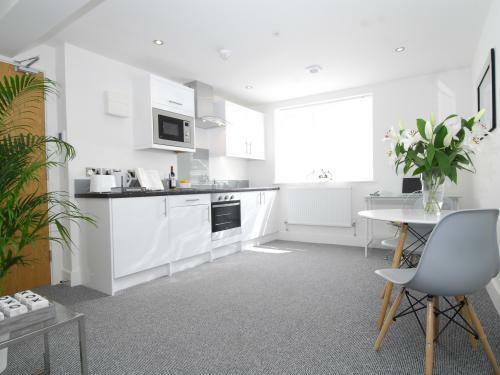 Foxhouse Studios offer modern style apartments in the heart of Plymouth City Centre. Our convenient location makes Foxhouse Studios the perfect stop for a holiday, or a business trip. All of our studios have an en-suite bathroom with complimentary toiletries, and big white fluffy towels. You have a fully equipped kitchen, which includes a fridge/freezer, oven and microwave. You can find crockery and cooking pans in the cupboards, and complimentary tea and coffee in your room. Every studio has a desk, T.V and hairdryer supplied as well. There is access to a common laundry room with washing machines and dryers. We also have irons and ironing boards available at the property. With the Plymouth Hoe only a 10 minutes’ walk away, you can wander down and enjoy the beautiful seaside views even on short-stay visits. The historical Barbican is also 5 minutes’ walk away, which offers magnificent views of the marina and sea. Stroll along the cobbled streets, and pop into the local shops and restaurants. Plymouth University is just 8 minutes’ walk away, making Fox Studios the ideal location for visitors. Visit The Drakes Circus shopping centre at just 5 minutes’ walk away for some retail therapy, or take a trip to the Theatre Royal (5 minutes’ walk) to catch the latest shows. Check-in starts from 2pm, and there is a Duty Manager on reception to check you in. Check-out is 11am, and we are happy to store your luggage for you for the day.